☃Material: Felt,Faux rabbit fur. Soft and comfortable texture andimpeccable crafts,quality and hand feeling is much better. 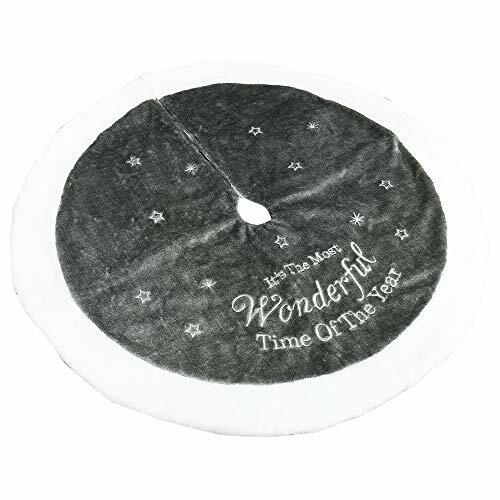 ☃PerfectChristmas tree skirt to dress your tree and add a special touch to your holidaydecor for years to come. A cute design and perfect for the holidays. ☃Easy to set up. Tree skirt easily wraps around an artificial or real Christmastrees. A quick way to decorate your home. ☃You can place it on anywhere you like,just likeliving room,bedroom, garden, bar,hotel, supermarket or somewhere else,perfectchristmas decorations indoor and outdoor. ☃This generous christmas tree skirt, also a nicechristmas gift for your families or friends. add more feast atmosphere to yourhome, show your unique tastey. ☃Material: Felt, Faux rabbit fur. Soft and comfortable texture and impeccable crafts,quality and hand feeling is much better. ☃Perfect Christmas tree skirt to dress your tree and add a special touch to your holiday decor for years to come. A cute design and perfect for the holidays. ☃Easy to set up. Tree skirt easily wraps around an artificial or real Christmas trees. A quick way to decorate your home. ☃You can place it on anywhere you like,just like living room,bedroom, garden, bar,hotel, supermarket or somewhere else,perfect christmas decorations indoor and outdoor. ☃This generous christmas tree skirt, also a nice christmas gift for your families or friends. add more feast atmosphere to your home, show your unique tastey. If you have any questions about this product by Interlink-UK, contact us by completing and submitting the form below. If you are looking for a specif part number, please include it with your message.